In 2016, the total trading volume on the Ukrainian Exchange fell by 47% YOY to UAH 3,534,769,611; the total number of transactions decreased by 51% and reached 137,512. The total trading volume on the derivatives market of the Ukrainian Exchange fell by 43% YOY to UAH 1,345,018,360 (201,694 contracts); the total number of transactions reached 26,485. The total trading volume on the securities market fell by 49% YOY to UAH 2,189,751,250; the total number of transactions decreased by 46% and reached 111,027. 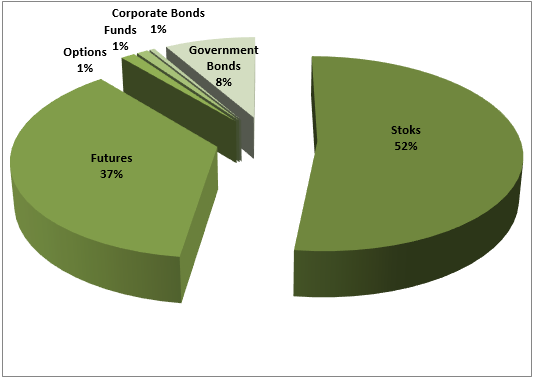 In 2016, equities marker became a volume leaded with total trading volume reaching UAH 1,840 million (52% of total trading volume); followed by derivatives market – UAH 1,298 million (37%) and investment certificate, bonds reached UAH 348 million (10%). 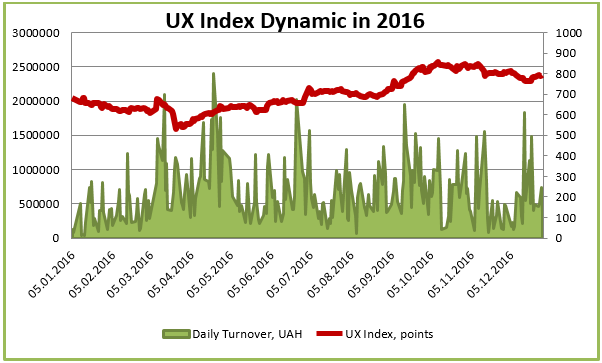 At the end of the year 2016, the UX Index calculated by the Ukrainian Exchange grew by 16,04% to 795,84 points. In 2016, equities of government bonds (UA92611) became the turnover leader with the total trading volume reaching UAH 106,824,705 followed by Centerenergo (CEEN) – UAH 68,362,880 and stoks of Motor Sich (MSICH) – UAH 52,432,671. Their total turnover share reached 18,06%, 11,56% and 8,86%, respectively.